I, like many others, studied the 1913 Strike and Lockout in school, I know the history of it, the facts, the figure, but never before has it been more alive in my mind than as I watched the Abbey Theatre’s production of “The Risen People” by James Plunkett, directed by Jimmy Fay. 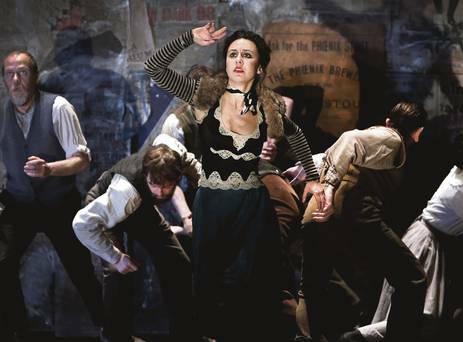 A moving and engaging piece of theatre, “The Risen People” brings the harsh reality of the lockout to life, reminds us of the day to day difficulties of the families involved and draws the audience into the world of Dublin in 1913. Every aspect of the production added to the atmosphere and drew the audience further into the story. The incredible musical numbers, directed by Conor Linehan are, in my opinion, some of the best I have ever seen. Some serve to convey the raw suffering of the people, some show the dissatisfaction that sparked the rising and some, such as “The Internationale” serve to rouse the spirits of the audience and give them a taste of the pride and drive that led the workers to stand up for their rights. The shadowy, cold lighting and sparse set are beautifully designed to give the audience a sense of the poverty and hardship felt by the workers. These, when combined with the excellent acting performances, particularly by the female characters, played by Hilda Fay, Charlotte McCurry and Kate Stanley Brennan, make for a truly breathtaking production. The cherry on top, which really brings the production into the here and now, is the Noble Call in which each night, a well known figure is invited to give their opinions on the production and share the message they gained from it through words, art or music. I can promise you that from the striking opening sequence through the stirring story, as the houses are emptied and the pawn shop is filled, to the final line, your eyes will be riveted to the stage and you will feel every emotion of every character. You will live the lockout. This entry was posted in Review and tagged Abbey Theatre, Review.